If you are at all interested in Fantasy or Fairtytale roleplay and aren’t familiar with Deviance you are really missing out. I was very fortunate recently to win two outfits from the lucky chair and two outfits from the cupcake dip. Outfit: “Blue Belle (Rose Red revisited)” comes with long and short version FREE in lucky dip at Deviance. I read about the group gift hair from D!va that comes in 8 colors this post from one of my favorite blogs. Add a skin from the lucky chair at Romi and you are ready to roleplay in several different themes in SL. 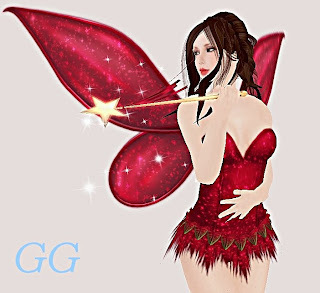 There are 4 lucky boards, a Midnight Mania, and 2 camping chairs at May’s Soul featuring outfits suitable for several roles in Gorean themes, panther wear that can double for Na'vi RP and kilts for men. Be sure to pick up the inauguration gift at the entrance. All looks shown with skins won from some of the many lucky boards at ::I CE COCO::. The hairstyles shown are just a few of what’s available in the Exclusive Hair Pack Jumbo Bundle available at Posh's main store at The Rumor. Shirt/Hijab combo: ::Sakinah:: Moospired Top & Hijab Free! Skirt and Top: ::Sakinah:: --Sakinah-- Aegyptia Outfit Free! 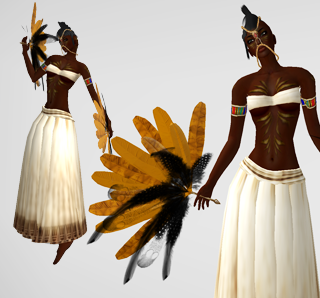 Avatar Skin/Shape/Hair/Head wear/Fans: Baiastice_Spiritual Dancer-Complete avatar Free! Right now is the Cart Sale at Car Wash which means LOTS of stuff for just 10L per item! Sale ends August 16. I'm going to try to awaken this blog and I invited some friends to help out. Welcome 6J and G4B to the Themed inSL team. If you look around, you’ll find two camping cushions, four lucky boards, and two MM’s and a bargain basement at Una & Luas with items for panther girls, slaves and free women.